A shout out to all the politicos who've given enough thought about a particular unfortunate set of circumstances but not a fraction more than passing thought as to the dorky-pants solutions they are trying to float to make things better: A "Space Force" or "Space Corps". Now contrary to what anyone just tuning in on the subject might think, the idea of a Space Force or Space Corps didn't spring up in President Trump's brain spontaneously, you now have to wade through pages of MSM click-bait articles in Google on "Trump" to find where starting last year, the idea for a 'Space Force' or more specifically a 'Space Corps' was being pushed in public by Alabama Congressman Mike Rogers. Why a separate Space Force, or Semi-separate Space Corps is a Dorky-Pants Solution. Problem: The problem we have in Space is the same problem we've always had: too many agencies with too many cooks stirring the pot. The problem, like most with DoD, is born on Congressional failure: Congress has failed to consolidate authority with the service responsible training and equipping forces for space in general (the USAF), instead Congress has chosen to preserve individual service interests in the service infrastructures and then lament the parochial attitudes. Whereas simply moving authority and resources to the service responsible for oversight of space interests, where it should already be (that's right, the Air Force) is the proper move, the Dorky-Pants solution would create ANOTHER new entity entirely and move (more likely unsuccessfully) all of the Space authority and responsibility from the existing services into that brand new entity. If the headquarters for that new service somehow elevated the prospects for Redstone Army Arsenal, the Army's missile mecca and Alabama's largest employer, I'm sure we could put that down to serendipity. Common Sense Solution: Consolidate authority where Congress already put the responsibility. This is easily determined by which service gets to spend the most time in front of bloviators explaining why something isn't like they want it to be. Hint: this would be the Air Force. A lot of 'futurists out there want a Space Force now. The discussion surrounding a possible separate military service responsible for "Space" has been heating up for years. Critics of the current system that has the Army, Air Force and Navy participating as components of a joint Strategic Command (an arrangement that has existed since 2002) feel the current system, like the system before it where individual service components reported to a unified U.S. Space Command, does not offer real advocacy for "Space". The usual criticism is that the system merely perpetuates the relative apportionment of the "space pie". Whether or not the criticism is valid is not germane to the question of a need for a separate space service. What must be done is to use the principles and rationales that were behind the creation of the existing services, and overlay them on the current question of a separate space force. Using this methodology it will become obvious that there is no valid reason for creating a separate Space Force at this time. The main difficulty in addressing the problem is that the individual service branches and the parent Department of Defense (DoD), as institutions, do not fully understand the reasons for the continued division in their responsibilities. They fail to understand the reasons because they do not recognize them. This failure comes about largely because the two most senior of the three independent services, the Army and the Navy have their conceptual roots in ancient history, and so the issue has not been thoroughly examined, or even greatly reflected upon, for centuries. It is also due to the fact that the third service, the Air Force, is still so new that some still believe it should be part of the other two services, and that the Air Force's own self-perception as an institution is still evolving(1). Service self-perceptions have been further muddied in light of the Goldwater-Nichols (2) Act which, among other changes, made the nine unified combatant commands' Commanders (formerly called CINCs) directly responsible to the President through the Secretary of Defense. These Commanders are America's "warlords", who command organizations that have "broad, continuing missions" and are "composed of forces from two or more military departments (3).” Thus, the chain of command above the actual combatant commands now circumvents individual service chains of command and cultures. The individual services are no longer directly connected to, much less responsible for, the conduct of war. Dilettantes and partisans assert that we have unnecessary overlap in the Roles and Missions of the different Services. Some have so grossly oversimplified the Service structures as to assert the US has ‘four air forces’ (4) or ‘two armies’(5). Setting aside resolving this issue for a moment, let us examine the specifics of the individual Service’s approach to the exploitation of the Space milieu. There was not even an American Air Force when the first military use of space occurred: the Nazi's V-2 rocket entered space on its sub-orbital hops from mainland Europe to England. At the end of the war, the Army and Navy vigorously pursued their own space programs using captured German technology as a seed for their own programs. The Army and Navy orbited the first and second United States military satellites respectively. The Air Force, as a new service in its own right, began immediately investigating military uses of space. The Army and Navy saw (and still see) space as critical to performing their mission, and all services acknowledge that the Space dimension of warfare is going to grow even more important. This relevance to all the services drives their concern for space. “Our Service views the flight domain of air and space as a seamless operational medium. The environmental differences between air and space do not separate employment of aerospace power within them.”(7). It is this concept of the medium, central to the Air Force view, which caused Air Force General Larry D. White to coin the term “aerospace,” in 1954, and also later led to the Air Force being assigned the land based leg of the strategic "Triad"; ICBMs. So all the Services find “Space” a critical element to their mission. When will Space warrant it’s own separate Service? As mentioned earlier, the key to justifying the origin of a separate Space Force is found in the origins of the existing services. The concept of an "Army" precedes recorded history, or at the very least has existed since history began. An army's purpose was (and is) to advance or defend some social construct. Since warfare only occurred on land, ancient armies were responsible for the total defense needs of a society. In ancient times, a state’s ‘navy’ was the sum total of all it’s sea-going fleet of merchant ships. Around 1200 BC, the first recorded sea battle occurred between the Egyptians and the Sea People. This first battle was between sea-borne infantry forces carried aboard small ships designed for other purposes. If the nature of man has not changed too much over the centuries, there can be little doubt this battle on the ocean set off the first calls for an independent combat Navy: But for centuries that followed, the Navy's sole combat purpose was to transport the Army to far shores for use in land battles. 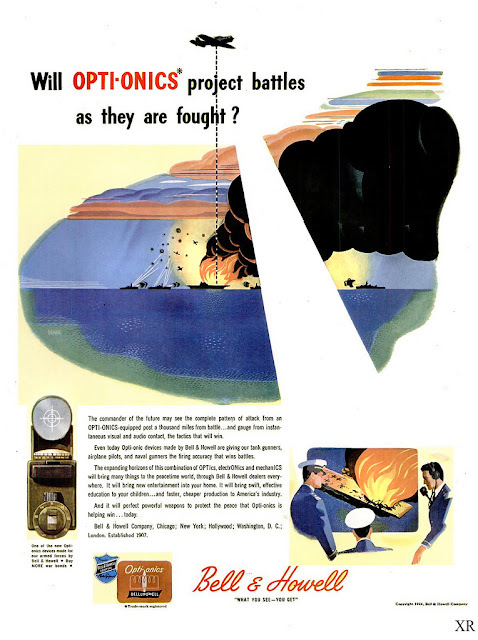 While occasionally sea combat occurred, it was always in context of supporting land-based objectives, by ramming the enemy and using foot soldiers engaged in close combat. Eventually, technologies were developed for sea-based combat, such as purpose built ships with catapults (the first naval artillery). Over time the growing importance of sea-borne trade to a society's survival also created a need to protect that trade. The focus then shifted to exploiting the sea medium as a means to directly support societal objectives, not exploiting the sea medium to support land-oriented combat. In short, control of the sea became an important objective in its own right. Modern discussions of the different services have focused on how their Roles and Missions are unique yet mutually supportive. But ‘Roles and Missions’ are the ‘what’ in how Service responsibilities differ and are merely products of the differences in ‘Mediums and Methods’. The ‘Mediums and Methods’ are the ‘why’ we have different Services. The other services still use the air (now aerospace) as an environment in exploiting their primary mediums, as the Air Force also uses the land and sea in exploiting aerospace. The key to understanding the delineation among the services is to understand that while they all use the land, sea, and aerospace mediums, each one is only responsible for development of methods to exploit one of the mediums. Thus, instead of thinking of the services in terms of Roles and Missions, it is more appropriate to think of the delineation in terms of Mediums and Methods. The Goldwater-Nichols Act has driven home this concept, by completing the separation of the individual services from the direct responsibility to conduct warfare operations and explicitly tasking the individual services for providing the right forces, through training, research and development, and acquisition, to exploit their respective mediums under a joint service effort. Air and Space or Aerospace? So at what point does Aerospace yield to "Space"? As stated earlier, the key to justifying the origin of a separate Space Force is found in the origins of the existing services. Each service is chartered to exploit a medium for national defense. The need for each service to become a separate entity came about when its medium and operation within that medium became important in its own right to a societal interest. At this time, all space operations (8) are important as a support element to or sub-part of operations in the other mediums, and clearly within the concept of Aerospace. As the 'space' portion of Aerospace becomes a more critical part of what would previously be considered pure "air" operations, it would probably be appropriate for the Air Force to become the Aerospace Force. Space will become an important medium in its own right when stand-alone activity in space becomes important to national interests. When space becomes an important medium in its own right, separate from its support function to operations in other mediums, space will warrant a separate service charter to exploit and develop the medium of Space sans "Aero." This will likely occur after we are living and working permanently in deep space, executing non-earth-centric operations and then only after we are out there with a more significant investment in resources and personnel. Examples of this kind of environment includes permanent self-sustaining space-borne activities, such as Lunar or Lagrangian-based large scale manufacturing concerns, that cannot be effectively protected or developed by Aerospace forces. Eventually, as extra-terrestrial colonization is established, a Space Force will be necessary to ensure free trade and movement among far-flung interests. (1) See The Masks of War and The Icarus Syndrome by the late Carl Builder for excellent analyses and summaries of the service branchs' self-perception. (2) See Goldwater-Nichols Act of 1986 at http://www.ndu.edu/library/pubs/gol-nich.html for a complete summary. Force, America’s Air Force Vision 2020: Global Vigilance, Reach, and Power, (Washington D.C., 2000), page 3. “This was kind of a cleanup, or a closeout, of (System Development and Demonstration). It’s the closeout of JSF developmental test for Block 3F, which is a big deal because it’s for Air Force IOC, and Navy IOC,” he said…. 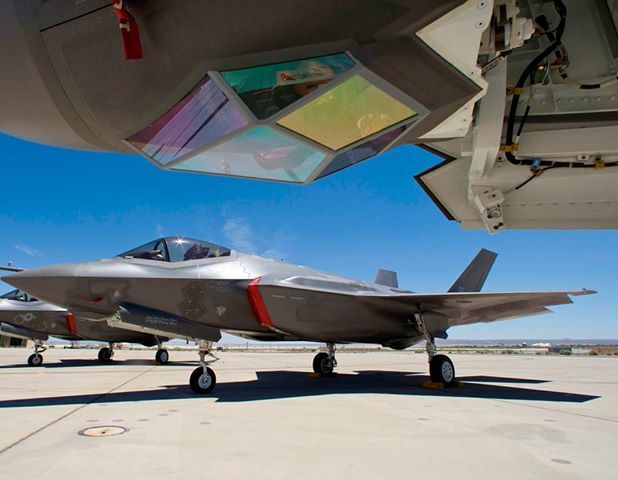 …There is a single WDA event remaining for 3F, which marks the completion for all three variants and will pave the way to the declaration of IOC for all F-35s. Now, If you are a journalist and EVER cited DOT&E as if they knew WTF they were talking about, then take a large mallet and apply it forcefully to your forehead in penance. Ye shall be known by thy flat face. What's the lesson here? 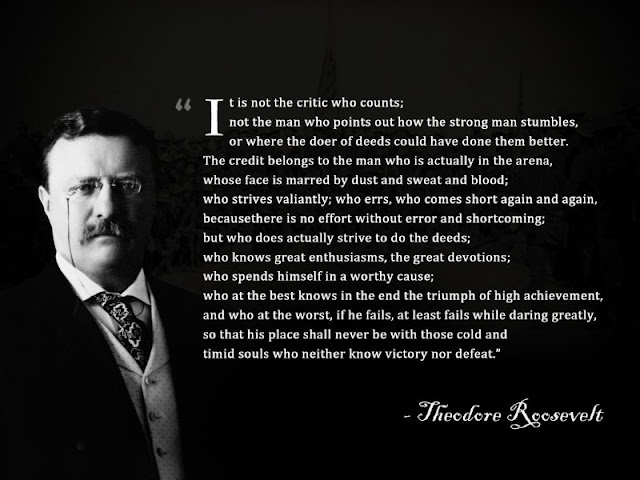 There is a reason this quote was displayed in the entryway to ASD HQ at Wright Patterson back in the 80s-Early 90s. A Survey: What does State of the Art Fighter Maneuverability Look Like? “In the late 1940's and early 1950’s, with the advent of jet propulsion, radical new wing designs and greatly expanded flight envelopes, a corresponding need for more definitive measures of merit for aircraft performance comparisons was generated. When the "century series" fighters were developed and rear-aspect IR missiles became the principal air-to-air combat weapon, point performance comparisons were found to be inconclusive and insufficient to predict superiority. Out of this need, energy-maneuverability (E-M) concepts were formulated and developed. In the 1960's. E-M came into widespread use by aircraft designers and fighter pilots. E-M provided an analog picture of a fighter's performance capabilities over a range of velocities and altitudes. It gave quantifiable credit to measures of merit which allowed the advantages of speed (energy) and turning (maneuverability) to be balanced. These measures of merit were shown to be dominant in determining the outcome of an air battle at that time. The authors of the original table and paper recognized the game changing aspects of being able to engage with missiles from 'all aspects' and those changes in their view re-jiggered the fighter maneuverability design priorities. As I see it, this would be a two part mental exercise. First we need to add columns on the right side of the table identifying any 'game-changing' developments that would cause further changes to the rankings shown. Stealth is an obvious development, but are there others like "very-high off-boresight missiles". Before I put too much grey matter onto the project, I thought I'd open the floor for ideas, and then decide (collectively if there is interest) first what order and perhaps grouping the header(s) should be populated from left to right. I THINK the columns should be added in order of chronological developments, but I don't KNOW yet: I try to keep an open mind until info is in hand. The end product of Phase 1/Question 1 would be the jumping off point for exploration of how these developments may change the relative rank ordering. I think I'm going to solicit inputs from F-16.net board members in a thread of its own, but I would welcome an even wider range of inputs and insights. What has changed since 1985 that would affect the rank ordering scores that each 'Agility Characteristic' (as the term is used in the table) would receive? F-35 Was NOT Inferior to F-16 in a 2015 "Dogfight"
This is a rework of something I posted on twice in 2015. 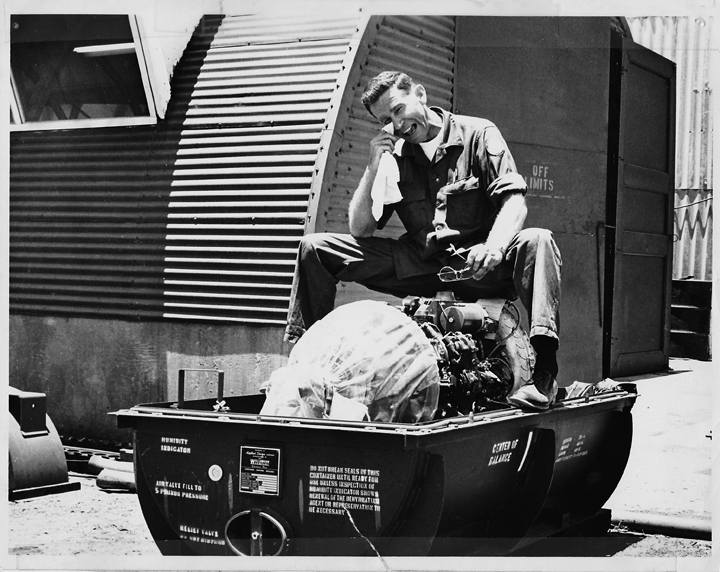 I'm doing the rework a a form of blog 'housekeeping'. When I wrote about it in 2015, the focus was on the echo-chamber, click-bait media claiming or inferring the CLAW test was a 'Dogfight' test. When I look back at that post, I now feel I buried the lede twice. The important bits were not how media tends to be F.O.S. for all their shenanigans (that's hardly 'news'), but the reasons WHY it was not a 'Dogfight' test, and that it can be clearly shown it was NOT a 'dogfight' test are. Nowadays that the 2015 'controversy' seems to be a perennial word-count filler: something for the lazy media to put in a piece to 'balance out' any positive information about the F-35 in any article or story that might appear to be otherwise 'favoring' the F-35. I want to be very specific in what I am claiming going forward. Assertion: The event in question was a post-stall agility test, testing for areas where it might be worthwhile to 'open up' the control laws (CLAWs) and was not a 'dogfight'. The JSFPO and Lockheed Martin at the time of this faux controversy asserted it was a CLAW test. The assertion was met with much snark and derision from the professional cynics and F-35 Haters, yet that is exactly what the test was about. and it was described in a published technical paper by an LM engineer who should certainly know WTF the test was going to be about at the time he wrote the paper. "The test objectives for high angle-of-attack testing are as follows: 1) Characterize the flyqualities [sic] at AoAs from 20° to the control law limit regime with operationally representative maneuvers. 2) Demonstrate the aircraft’s ability to recover from out of control flight and assess deep stall susceptibility 3) Evaluate the effectiveness and usefulness of the automatic pitch rocker (APR) 4) Evaluate departure resistance at both positive and negative AoA with center of gravity (CG) positions up to the aft limit and with maximum lateral asymmetry. 5) Assess the handling qualities of the aircraft in the High AoA flight." With intentional departure testing [Objective #4] wrapped up, the team will soon move into departure resistance [Still Objective #4] and plan to remove the SRC now that these systems have been verified. In this phase of testing, the jet will test the CLAW limiters with much higher energy and rates than previous testing, fleshing out and correcting areas that may be departure prone. 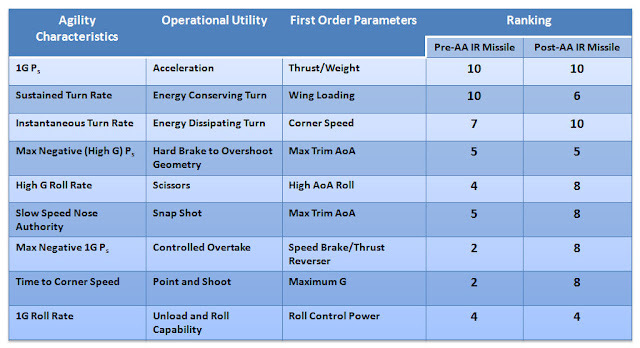 Lastly, select operational maneuvers [Objective #5], such as a slow down turn and a Split-S, will be used to gather handling qualities data on high AoA maneuvers. With the completion of this phase, the F-35 will be released for initial operational capability in the high AoA region. Note: 'SRC' is a 'Spin Recovery Chute'. So with this paragraph, not only does the author expound on the exploring of "legacy high AoA maneuvers" that is to come, he specifically identifies Objective 5 test as having "Handling Qualities" objectives and explicitly states that the kind of testing that will "truly develop high AoA maneuvers for the F-35" to the testing Operational Testers will perform later and excluded from the Edwards AFB Developmental Test Team activities. 2. WAS accurately asserting the truth about what the testing purpose truly was. By next year and the roll out of '3F' software/capabilities I doubt if you will be able to find an F-16 pilot who has flown the F-35 that would not pick the F-35 over the F-16. 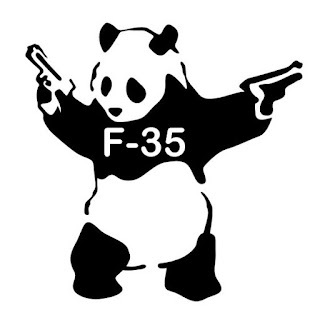 With the world about to bear witness at the Paris Air Show (#PAS17) this week that the F-35 is NOT the 'pig' aircraft that the propagandist critics (all of whom have NO material knowledge of the F-35) have claimed, I decided it was time to finally publish this post and close out the series. All the contrived elaborate and ignorant ‘stories’ assembled from twisted factoids that have surfaced over the years, are about to fall flat, and will trigger much denial, wailing and gnashing of teeth from those quarters. Now is also an especially good time for me to close out the series because it will be a handy reference for later smacking down a piece of anti-JSF Dezinformatsia that surfaced (as a metaphorical rotting dead cetacean) this week. Behold! O haters and doubters.....and weep. The entire point of this series has been and is to illustrate that fighter design isn’t driven by opinions, whim, or fashion; nor is the implementation of it either the least bit capricious. To recap, Part 1 of this series was just an initial outline of what I intended to cover/accomplish overall. Part 2 was an extended ‘two-parts in one’ review of the evolution of fighter design requirements from the earliest days and up through the emergence of ‘supermaneuverability’. We reviewed the developments that influenced fighter designs up through to the ‘fourth-generation’ of fighters and we could even say included design trends that influenced the earliest aerodynamics of fifth generation design: the F-22. As it turns out, we can leverage one and a half decades of expertise from professionals to accomplish the first objective and do so in fewer words than I had initially planned. We will also use the same for framing the discussion to meet the second objective: quickly ‘apprising’ the “F-35’s potential advantages and disadvantages”. It should shock only those with less than a passing interest in, and/or superficial knowledge of the subject, that by the time the first Part 3 objective is met, the second objective will become largely self-evident. “Aircraft Maneuverability” or “Agility” research probably reached its zenith (in the West anyway) with the extremely successful X-31 Enhanced Fighter Maneuverability Demonstrator program. Before the X-31 even flew, it was already viewed as a key investigative tool for ‘applied agility’ research, and the only effort at the time to span all “applied” research areas of interest. I was TDY to Edwards AFB for one program or another and we had just landed (it had to have been sometime in 1992 or January-ish 1993 at the latest) and while sitting on the ramp waiting for a crew van, we watched the X-31 return from a mission and work the pattern with its chase plane. The discussion, led by our own test pilots and flight test engineers, turned to wondering: Just how much any additional maneuverability that might come out of the X-31 program would actually translate into any REAL additional combat capability? This is a question of the same kind of ‘asymptotic limits’ that were addressed in Part 2. 2) When costs involved are considered, there are cheaper/better ways to increase combat offensive capability and survivability than improving AoA, turn rates, or g-loads past the present state of the art. We know these are the answers because those involved in fighter design and development have known them for a long time. From 1986 through at least 1995, the NATO member countries of France, Germany, the United Kingdom, and the United States collaborated on a major study1 to determine where future fighter design efforts should be targeted. While I’ve been too busy to engage in substantial posting for a lot of reasons, another reason this post was so long in coming is the open source data has been fickle. I first typed out about 4K words (longer than this post) I had put to electrons just to go over the gory details in the study we are about to discuss. But after all that work trying to do justice to the contents of the study I found a copy of the original without a paywall in place. I slashed what I had written to leverage the source without saving the earlier version. Then the source disappeared again. If access reappears, I'll link to it. • Through analysis and simulation, determine whether supermaneuverability is operationally useful in future air combat scenarios. • If operationally useful and technically feasible, determine the practical limits of supermaneuverability and full envelope agility. The context of the study was obviously about the benefits of supermaneuverability in WVR combat. The authors referred to it as “Close In Combat” (CIC), of which choosing to engage in a turning fight is only one possibility. After all there’s not much point in doing a Danse Macabre if there’s no opponent within visual range to ‘appreciate’ it. Previous analyses and manned simulations for close-in-combat (CIC), primarily emphasizing 1 v. 1, have indicated substantial improvements in air combat effectiveness when supermaneuverability (in particular, post-stall technology) was incorporated in advanced fighter designs. Recognizing that air combat scenarios are likely characterized by rapid transition from beyond-visual-range (BVR) to CIC involving multiple aircraft, the effect of supermaneuverability technologies on the outcome of this type of engagement needs to be determined. This multi-national NATO-sponsored study began with manned simulation at Industrieanlagen-Betriebsgesellschaft (iABG), involving two piloted aircraft and three computer generated aircraft. Four pilots were trained on the baseline post-stall aircraft including avionics, weapons, and scenarios. After the training phase, the pilots jointly determined possible starting conditions (geometry, speed, weight, weapons load, number of runs, etc.). The purpose of the manned simulation was to create a database to develop a digital pilot reaction model. The application of a batch model was necessary in order to generate the large number of computer runs needed to accomplish the project goals. The batch simulation strategy involved three different programs. First, the ‘Arena’ war simulation program was used to model a beyond-visual-range, many-on-many air battle and generate within-visual-range starting conditions. This was a valuable technique that got the study group past the ‘How do we set up realistic WVR combat starting points?’ question. 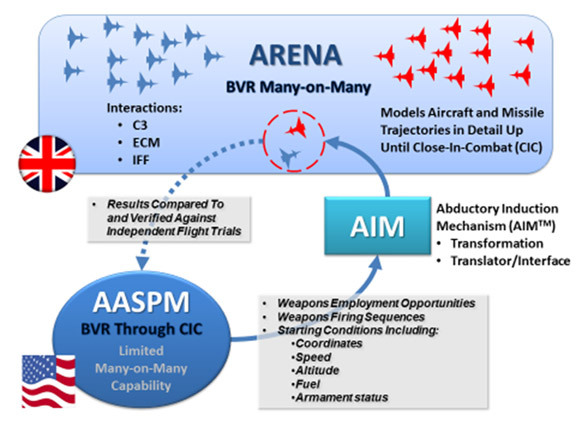 Second, the Air-to-Air System Performance Evaluation Model (AASPEM) was used to model one-versus-one (1 v 1) engagements that were initialized under the Arena-derived starting conditions. Third, the Abductory Induction Mechanism (AIM™) was used to link AASPEM results to Arena as depicted in Fig. 3. As you can see by the parsing of function among different models, it wasn’t easy to do complex scenario modeling back in the 80’s-90’s. The primary models had to be linked because neither one could answer the questions ask if used as standalone devices. An evolved MIL-ASSPEM II was part of the USAF’s standard analysis toolkit as late as 2005. It might still be. The study identified and used probability of kill, probability of survival, and exchange ratio as “the key parameters” using two types of weapons: missiles and guns. For each weapon type they assigned a probability of a kill (Pk) given a ‘hit’. Under a ‘massive-number-of-trials’ modeling effort, they established an average Pk of a (AIM-9L ‘like’) missile of 0.8 for each simulated missile fly-out. The Pk (given a ‘hit’) of the missiles being held constant may have made some of the long-term study quantifiable results more conservative ‘offensively’ and more optimistic ‘defensively’ than optimum, given the lethality enhancements seen with AIM-9 and AIM-120 developments ongoing at the time and later. The advantage of using a constant Missile Pk value is that it prevents missile lethality from dominating the calculations and masking nuances in outcomes due to other variations in the aircraft/missile (as a system) combinations. ‘Pk’ for the gun was more complex, and was based upon a function of the maximum burst length for one firing and the time duration of the gun hits within that burst. The baseline “good-guys” (Blue aircraft) were assumed to have the ‘agility’ of the X-31, and the baseline “bad-guys” (Red aircraft) represented an “F-18 type aircraft”. Given the study timeframe we can probably assume the “F-18 type” aircraft comparisons were based upon the F-18C/D versions. The study group ran multiple excursions of the 'sort-of-a-metamodel' they created, exploring the relative impacts of increasing aircraft and weapons capabilities on the outcomes of air combat engagements. 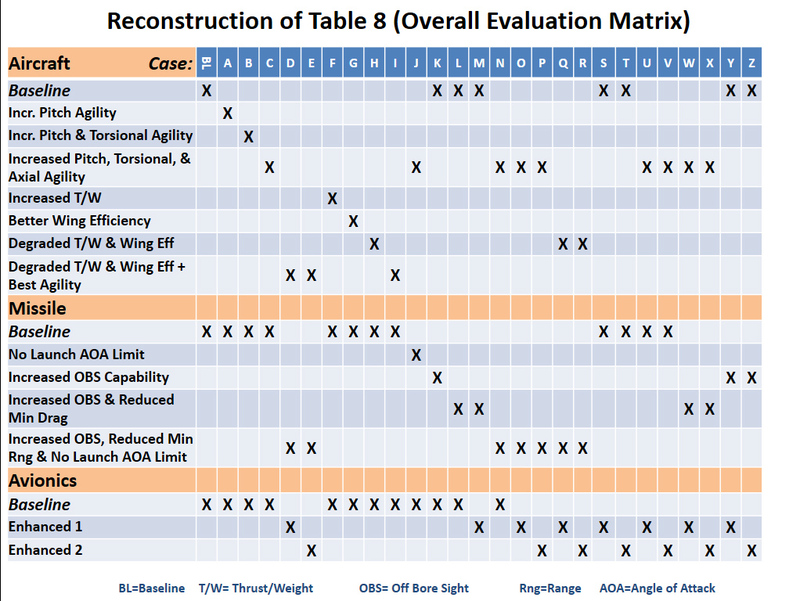 A recreation of the contents in the matrix of different test cases explored and as summarized in the study’s Table 8 is shown in Figure 4. Figure 4. Cases studied in "Practical Limits of Supermaneuverability and Full Envelope Agility"
All of these criteria were controls based upon expert analysis and historical records except the “No Kill Removals”. 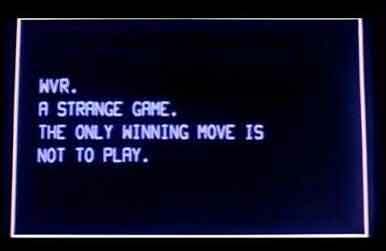 The ability to count wins and losses in a test run without ‘kills’ that would remove the killed aircraft from the equation allowed for many more engagements (trials) to add up within each computer simulation run. This approach in modeling was akin to the process of re-spawning adversary aircraft in Red Flag or similar exercises, though with a somewhat different purpose. Today, we would run more trials with actual removals because computer time is cheaper and the runs are faster. In trying all the various combinations of possible enhancements (and degradations) the authors produced many relevant ‘findings’ associated with each of the design changes and combinations thereof. 1. Aircraft Agility Changes: Blue’s losses were serious, but Red Losses were even worse. Blue losses were seen as high (around 45%) for the baseline case; aircraft agility increased the red losses by 20%, while blue losses increased slightly. 2. Enhanced Missile Capability: Blue’s losses were still serious, but Red Losses were even more severe. Blue losses were high (around 45%). However, red losses increased drastically to near 70% against the most capable missile option. 3. Enhanced Avionics: Just improving avionics didn’t help Blue’s effectiveness or survivability. Overall, there was virtually no effect on exchange ratio or losses (which, once again, were around 45%) for the Blue Force. 4. Combined Short-Range Missile (SRM) and Avionics Enhancements. Blue losses are again high (40-45%). Red losses were slightly lower than that for the same missile using baseline avionics, but still significant approaching 70%. 5. Aircraft Agility with SRM Enhancements. Losses remained high (up to 52% for blue and up to 66% for red). 6. Aircraft Agility with Avionics Enhancements. Red losses were again higher than blue losses (20% higher), but both remained high (above 45%). 7. Combined Enhancements. Again, blue losses were high (48% for the "best" system). Red losses increased to beyond 70%. The biggest benefit of EFM that could be drawn from the study was that EFM pays off significantly IF the A2A fight STARTS very ‘close in’ under 1 v. 1 situations AND inside the minimum range (Rmin) of the ‘then-era’ of Short Range Missiles with limited OBC (Off-Boresight Capability up to 30°), AND IF no further aircraft enter the combat (remains a 1 vs 1 engagement). Within the study, EFM largely enhanced gun firing opportunities that come well after the initial ‘long-game’ has been played and those outcomes settled. That advantage is now questionable with SRMs that have very high OBS capability. No one has to actually point anywhere near the opponent in WVR combat anymore to be able to take offensive action against that opponent. And for the readers who just skimmed the WVR engagement outcomes above and didn't see Figure 5, let us now explicitly state that the WVR ‘short game’ IF it comes at all, during the course of this study was determined to be an unsustainable “loser’s game” between comparable opponents. This has now been known for decades, and findings such as these had to have influenced the definition of the F-35’s requirements. 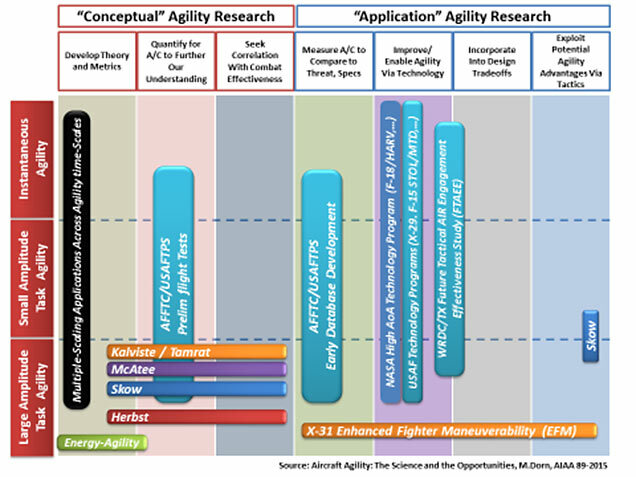 Given that 1) ‘modern’ low observability predates this study significantly-- at least in the U.S.—and 2) low observability makes a foe far more lethal to 4th generation and earlier aircraft as well as more dangerous surface to air systems, it should speak volumes to any reasonable person as to why the design thrust of the F-22 and F-35 (and now others) emphasizes the reduction of susceptibility to being targeted in the first place, while (as in the case of the F-35) also emphasizes the ability to sense, discern, and assist the pilot in dealing with external threats as effectively and efficiently as possible. We can be certain that the responsible agencies involved conducted manifold similar studies involving the effects and limits of low observability in combination with all other design drivers to produce the latest fighter designs. I can’t imagine what kind of thinking is required by the uninvolved to imagine the professionals make these kinds of analyses and force structure decisions without due diligence. How many more pilots, planes, and support assets would ‘blue’ forces need to win a war of attrition if only WVR-capable “day fighters” and/or non-‘stealth’ aircraft are involved? This is an important question. After all, simple ‘less capable’ fighters are what all those earnest and/or Faux Reform critics advocate to varying degree when they are insisting the actual experts are doing fighter acquisition “wrong”. Advocates of less capable systems are advocates for a strategy of Wars of Attrition. The frequency--how often WVR conditions would occur between aircraft (again, they were all non-LO aircraft) -- was to be a subject of the Arena runs of the future. I’ve not found the results of this effort in unclassified sources, but given what we’ve learned from all air combat that has occurred since that time, and experiences in major exercises such as in recent Red Flags, I would suspect WVR encounters, and certainly 'extended turning' fights, will become even more of a rarity. Given the improved min-range performance of short-range missiles and future non-kinetic weapon solutions on the horizon, extended maneuvering fights might become extinct. At the very least, they could become ‘black-swan’ encounters not worthy of driving aircraft design in the future nearly as much as in the past, that is, at least for the foreseeable future. How potential enemies see the future is indicated in how hard they work to either follow the US lead in design trends or in attempting to devise ways to mitigate the advantages sought by the U.S. and its allies. “Advantages” such as those that come from the capabilities of the Fifth Generation fighters. Operational requirements have evolved continuously since the first fighters flew. It would be as large a folly to insist that a fleet of 4th generation fighters could meet the needs of current and foreseeable operational requirements as to insist a WWI aircraft could meet the requirements of a WWII operational environment. Compare what we know now about ‘where’ air-to-air combat is going with the kinds of capabilities built into fighters like the F-35 and F-22, and what potential ‘near-peers’ are trying to build. Given the study findings, 5th generation fighter capabilities, and actual air combat history, WVR combat is now something to be even avoided more; something any A2A combatant would seek to avoid if at all possible and only to be endured if unavoidable. Defense planning and foresight informed by experience and research, such as that embodied in the study we just reviewed, produces the requirements for future weapon systems that resulted in the F-35. I marvel at how much hybris the uninformed must possess to shamelessly assert alternate realities while second guessing legions of actual subject matter experts who have done the work day-in and day-out for decades to deliver viable solutions to defense requirements, and who have access to the kind of data and history needed to actually carry out such responsibilities. The future of fighter design and design requirements will change as the operational environment changes. This is why as soon as one ‘generation’ of fighters is being fielded, work begins to define what will be needed in the next generation. Work on what became the F-15 began as soon as the AF got the F-4. The F-22 is descended from the first efforts to define what would be needed after the F-15 as the first F-15s were in development. Yes, we can envision some of these future changes (lasers anyone?) and can imagine how strategists and designers will cope with them. But the entire battlespace will continue to be reshaped beyond any analyst’s imagination and prevent them from peering too far into the future just as it always has been. Nowhere in this series of posts, or in any other posts the reader will find here, is the assertion made that ‘maneuverability’ (however one defines it) is "unimportant"-- in the past, modern day or immediate future. This must be stated unambiguously up front because I've seen the tiresome broad-brush accusation of same made too often when anyone dares challenge some closely held belief as to maneuverability’s relative importance to fighter design, or dares challenge the vague reasons why many of the uninitiated think “maneuverability” is important. A Request in Closing: If history repeats itself, when this post is referenced on a ‘board’ or comment thread somewhere, some yahoo is probably going to contest what I have written as “SMSgt Mac is wrong…”. As if their disagreement is with ‘me’-- when they’re really expressing their disagreement with…y’know…the ACTUAL experts I cited. I usually trip over these weak statements. while looking for something else, ages (sometimes years) after the mischaracterization of what I typed is displayed: long after the disinformation damage is done and everyone has since moved on to other topics. Soooo…If one finds this happening somewhere after this post, it would be much appreciated if a reader or two would reply in response that “SMSgt Mac said you would try that B.S. deflection”. Feel free to use the direct quote. 1. Practical Limits of Supermaneuverability and Full Envelope Agility; B.A. Kish, D.R. 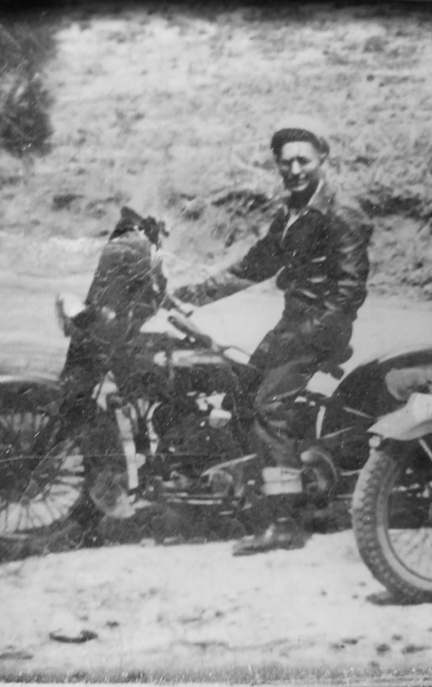 Mittlestead, G. Wunderlich, J.M. Tokar, T. Hooper, R. Hare, H. Duchatelle, P. Le Blaye; Proceedings from the AIAA Flight Simulation Technologies Conference, San Diego, CA, July 29-31, 1996; PP 177-187; AIAA Paper 96-3493. 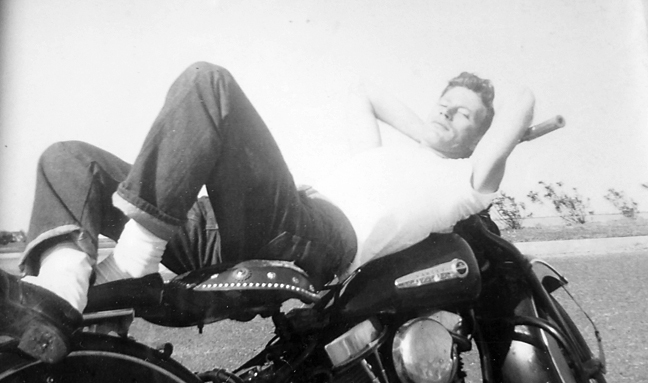 Dads, you are terribly missed. But you live on in our hearts. 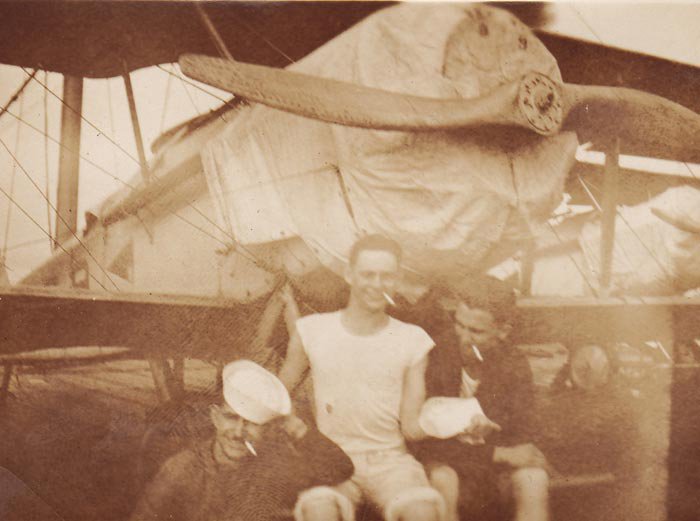 Granddad (Left) Enroute to San Diego on the USS Langley's 1st deployment to the Pacific Fleet 1924. Dad hamming it up, Vung Tau SVN April 1966, A 'happening place'. 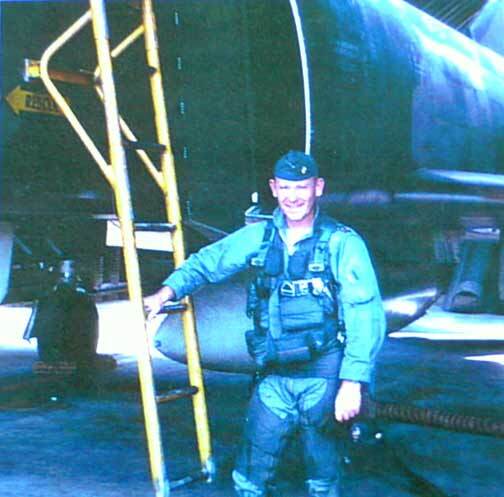 My late Father-in-law "Rusty" Wall, Da Nang SVN with the First F-4Es: 1969, 4th Fighter Sq, 366th Fighter Wing. We Can't let an F-35 Myth Die! The "Phone it in Edition"
The only thing worse than 'phoning it in'.... is doing so with incredibly poor timing. --Dave Majumdar, a journalist who rode in the back seat of a trainer someplace. When Majumdar first started at FlightGlobal he showed promise. Alas, unrealized to date. Eats, Shoots, and Leaves: F-35 Edition. 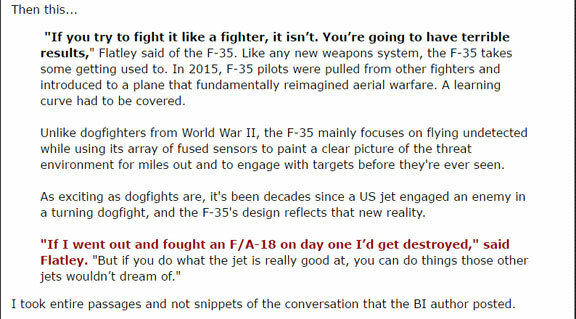 There was a poor article published at Business Insider (as if that is a surprise) on 18 April where the author did a mashup of an interview of a retired USMC Major and F-35 pilot with a bunch of factoids, a few facts, and...well, let's just call it a lot of 'other than facts', such as repeating the lie about the 2015 CLAW test being a 'dogfight' and claims like. The F-35A's mid-mission T/W ratio is better than 1 to 1, good enough to have pilots saying that at typical WVR speeds it can out accelerate an F-16. The F-35A's wing reference area is greater than an F-16 so one presumes he was talking about 'wing loading' -- which isn't a big deal if you've got the thrust to overcome it. I would still dearly love it if some enterprising journalist ever asked how many thousand pounds heavier the early production F-35A (AF-2) with instrumentation is than the first production spec weight target aircraft that was built several LRIPs later. Because weight matters. What the pilot, Dan Flatley had to say was pretty good and consistent with all the other feedback from the people who fly the F-35 are saying. I think it should have been made clear that his views as a syllabus developer were in no way relevant to the JSF program process and pace in opening up the control laws (the very purpose of that 2015 exercise and publically known a year in advance), but the BI author seems to tie the two together more than the pilot does. Everyone in the test program knew the control laws start out conservative for safety's sake and over time as the envelope is tested, the control laws get loosened to get all the 'safe' performance out of a jet that possible. I'd also want some clarifications, but that need comes from the author's mashup. One has to read very carefully to keep from mixing up what the author asserts and the correlations he draws on his own with the interview: what was actually quoted as coming from the Major. The author doesn't have the technical chops to draw the correlations he does make (see thrust/weight ratio), and to me, unless you already knew what was going on, the article just muddies the waters. So as if that's not bad enough, we now have a sterling example of how perverted 'copypasta' will take a poorly written article and turn it into a misquoted source. Compare the BI excerpt with an excerpt from a blogger posting opinions on the subject. Who the blogger is isn't important, what's important is what gets changed in the original story. Ignoring the highlights in the second graphic, do you see what was changed and how the entire meaning of the passage was changed with it? "If you try to fly it like the fighter it isn't, you're going to have terrible results." "If you try to fly it like the fighter, it isn't. You're going to have terrible results." I hope there's no need to explain how, why, and what meaning has been lost in the translation there. The blogger then builds a whole rant based on a misquote he made in the transcription. I do not believe this was intentional, at least I hope it wasn't. BI doesn't allow simple copy/paste using at least some browsers, including mine, so the transcription was probably manual and prone to human error. But I have to believe preconceived notions caused the mistranslation from one site to the next. Why? To make that kind of error, it seems you would have to want it to be as you perceived it to even want to post about it in the first place. The saddest thing is, I checked the comments (69 at the time) and not one person called the blogger out on the error. Almost certainly for most it was because the error reaffirmed their own world view, and the rest seemed to just take it at face value that the quote was legit and correct, whether they agreed or disagreed. This is how B.S. thrives on the web. Note: I found the blog post with a search engine while looking for the BI article. It was at a site I used to frequent and my curiosity was piqued. Considering the time of night, I shouldn't have bothered in retrospect. President Trump & The F-35: He's Done the Impossible! F-35 Costs coming down as expected. Deal with it. President Trump set wheels in motion that have turned the long-standing 'F-35 is unaffordable' deception inside out. The whole world now knows the F-35 unit costs are coming down exactly as planned and for -- as any honest person who's been paying attention already knows -- the same reasons the program has been citing all along. How did Pres. Trump spread the word/change the narrative so quickly? He leveraged the mainstream media's 'narrative priorities' and the lockstep and unthinking pursuit of narrative to suit their priorities. 1. We now have outlets like the Washington Post shifting their 'all negative' cost narrative found in past F-35 reporting to finding themselves having to not only acknowledge, but ASSERT the costs were coming down anyway, and AS PLANNED in an attempt to deny President Trump any credit for same. 2. And when the media latched, again in lockstep, onto the "costs were already coming down" story, LM's CEO casually mentions 'but' the President DID help, if only by sharpening the negotiations' focus on 'Costs'. 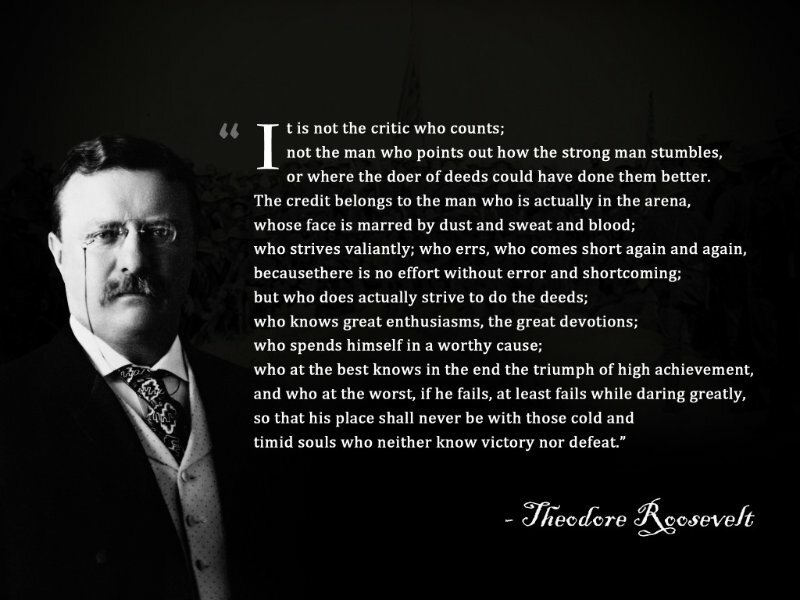 A man may do an immense deal of good, if he does not care who gets the credit for it. I don't care what people think about 'why' the unit costs are coming down as planned. I'm happy just knowing that people know they ARE coming down. Driving the media crazy over it is just a Trump side-benefit. This Fighter Program's Problems are Outrageous! Time for another round of Name That Program! (17) more realistic assumptions indicate that, although the total procurement cost will decrease, the XXXXXXXX unit cost will be more than the XXXXXXXX currently estimates. Just envision that's a 'Predator' or 'Global Hawk' silhouette we see looking down on the battlefield. B&H is still with us-- somewhat transmogrified--too. It is interesting that CNN focuses on the body count. It does gives proof to the old adage "If it bleeds it leads' but my, how 'Southeast Asia 1965' of them. A: So ISIS never saw us coming. Q: Why 2 B-2s to drop 38 weapons when 1 can carry 80 500lb JDAMs? A: To bomb both locations at the same time, like probably down to the last second unless they wanted to cause a response in one first by bombing the other. And more than 38-40 would have probably been overkill. b. it will also make the survivors look up in the sky at night and loose their beauty sleep. The immediate and later costs of letting any attacks happen probably far outweighed the cost of flying 2 B-2s and expending a few bombs. There are some less obvious positives about this, given the 'international' interest in the region, but I will not air them here. I had a very small role in fielding the Smart Bomb Rack Assembly (Smart BRA: gotta' love it). I suppose since they dropped only 38 JDAMs they could have used the Rotary Launchers (RLAs) but that's OK too, since I also played a small role developing and testing the smart weapons interface that allowed GATS/GAM then JDAMs etc. to be dropped as well. I feel pretty good about all that right now. Updated 20 Jan 17: Well now the reports coming in say 'over 100' JDAMs, and some specifically assert 110 JDAMs were dropped in two camps. It appears by some accounts there were to be up to four camps targeted initially but the terrorists had consolidated as well as relocated between the time the missions were conceived and executed. I'm sure the AF still enjoys it when targets bunch up. It would have been hard to move assets around the Middle East to hit Libya like this without contrarian interests leaking it beforehand, I still remember Operation Allied Force and how ops departures out of Comiso seemed to be on TV in real time. The message here is: you won't see us coming unless we want you to. As it perhaps looked like a last tasking from Former President Obama to our enemies, I imagine they were just as surprised as some of the media appear to be when a Buff and UAVs took out a few AlQaeda in Syria in followup. Not the 'Second Engine for the F-35' Cr*p Again! Oh dear, if only the world was this simple. Breaking Defense has an advocacy piece up at Breaking Defense titled: "Trump Wants Lower F-35 Costs, He Should Compete F135 Engine" from Retired USAF Colonel John Venable (who is now with the Heritage Center). In it, Venable tries to make a case for reviving a second engine effort for the F-35. But in typical AF 'advocacy style guide' fashion, elides right by many key factors to consider while throwing all possible arguments at the wall trying to make one stick. I wanted to just make a comment at BD, but since they've invoked the ads among the commenters in their comment threads their web page tends to crash on me for all but the shortest comments. Could be the times, could be my system (Adobe updater is always a suspect). In any case, here are my observations on the sales pitch Venable makes. Read the whole BD article first to see the targets of my counterpoints. ‘Competition!’ is almost always a good thing in an open commercial and ‘free’ market, the kind of market most of us deal with every day. However, it is only a good idea sometimes, under certain conditions, in a monopsonistic (such as ‘defense’) market. At the risk of oversimplifying almost as much as the author, in a defense market a competition is generally ‘good’ for reducing risk and improving technical outcomes, but generally NOT good for reducing ‘cost’. The body of defense acquisition research is awash with the whys and wherefores of when and how a program should invoke competition. Though people like to point to the Great Engine War history in this instance, they tend to forget that most of that ‘narrative’ was written before the history had fully played out. Later views on the utility and relevance of that competition to the F-35 are far more nuanced than simple invocation of the Great Engine War can convey. Not to put too fine a point on it, there are certain requirements for a successful (cost lowering) competition (see here for starters) and one of the most important set of conditions has to do with the total volume of work competed AND the rate to which it is to be performed. Two operations running at reduced capacity are NOT cheaper than one running at full capacity. So if the author and Heritage want to advocate competition in this case, they need to caveat that advocacy with a requirement to ramp up the F-35 production rates sufficiently and far enough ahead of any doubling of the number of engine suppliers to ensure sufficient and worthwhile demand for same. Finally, given the program is looking to refresh F-35 engine technology, you better have the second engine supplier qualified and production ramped up yesterday if you don’t want it competing with the effort that now appears to be on the F-35's horizon (mid 2020s). How much so-called 'savings' can possibly accrue if there's only a couple of years production involved? 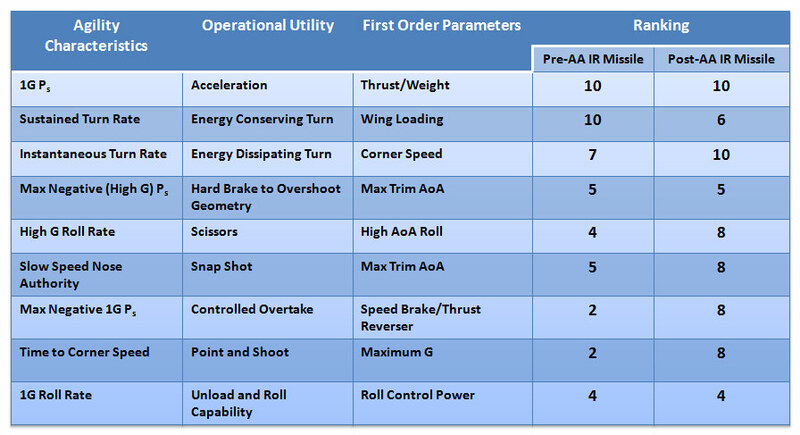 Is the author aware that the F-35 variants are all at or below their target weights for the end of SDD? Is he aware that those target weights were set with an allowance for further weight growth already factored in? 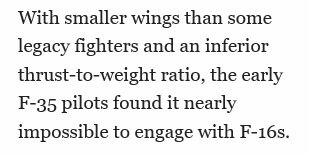 Is the author aware that weight growth in past aircraft (both the F-16 and F-18 spring immediately to mind) was driven primarily by scabbing kinds of needed systems (sensors, EW, etc.) onto them that are already integral to the F-35 design and already installed or have their weight already accounted for in the target weights? Is the author aware that increased thrust has been available from the F135 for some time if is needed, but increased thrust will require changes/differences in the F-35B along with associated program cost increases to incorporate? While we’re on the subject of cost, no doubt the author also has a plan to add a couple of $B to the program in order to finish development of a second engine, to include getting everyone on board with the idea AND happy about the extra cost involved including the cheapskates budget conscious and the faux military reform industry. Is the author aware that the transonic acceleration and sustained turn KPPS are only factors in the trade space below Lethality and Survivability requirements, and that their values are only relevant as contributors to the overall requirements? If the program is not concerned, the author ought to first find out 'why' before engaging in public handwringing. I've examined these KPPs before (here and here) so I get why the program isn't too concerned. As the KPP values were established with a mid-mission weight and payload involved, and assuming some degraded engine performance towards end of life, perhaps some of the author's concerns will be allayed knowing that similarly equipped F-16s in most cases couldn't do any better? 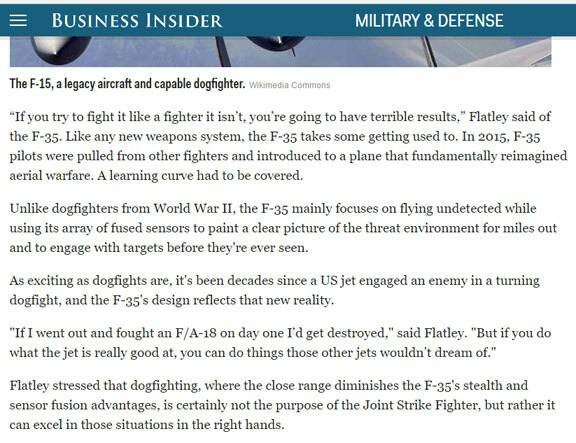 Since the author is a recognized top fighter pilot and ‘patch wearer’ who came of age in the aftermath of all-aspect short-range IR missiles, he surely must be cognizant of the fact that these two parameters have taken a backseat to instantaneous turn rate, time to corner speed, and low speed nose pointing: three measures of agility that from what the pilots are saying are where the F-35 excels. 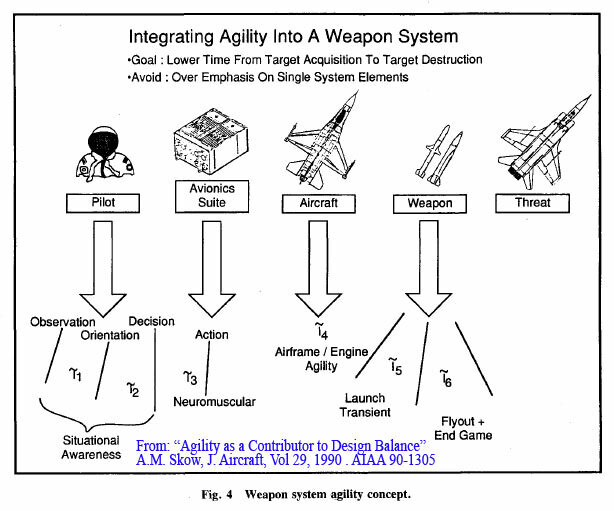 We won’t go into it here, but even these measures of agility may have been rendered less important with higher off-boresight and 'shorter minimum' range missiles (that's probably going to come in the next part or part after of my fighter design series by the way--still working on it). In any case, advocating more thrust to improve these metrics is pretty hapless if one thinks about the speed regions involved. It's probably more important that the F-35 variants are meeting/beating their weight targets. In the spring of 2010, the F136 was only 700 hours into a 10,000 hour test program and had not been flight tested. No one knows what problems it would have encountered had it been fully developed. But in its cancellation, the F136 has become the mythical 'success-that-could-have-been-but-never-was' to the proverbial ‘some’ in the backbenches. Let's keep the F136 the mythical success it is, at least as far as the F-35 is concerned.